In 1907 Romsey held a pageant to celebrate the Abbey’s 1000th birthday since it was founded by King Edward the Elder in 907CE. 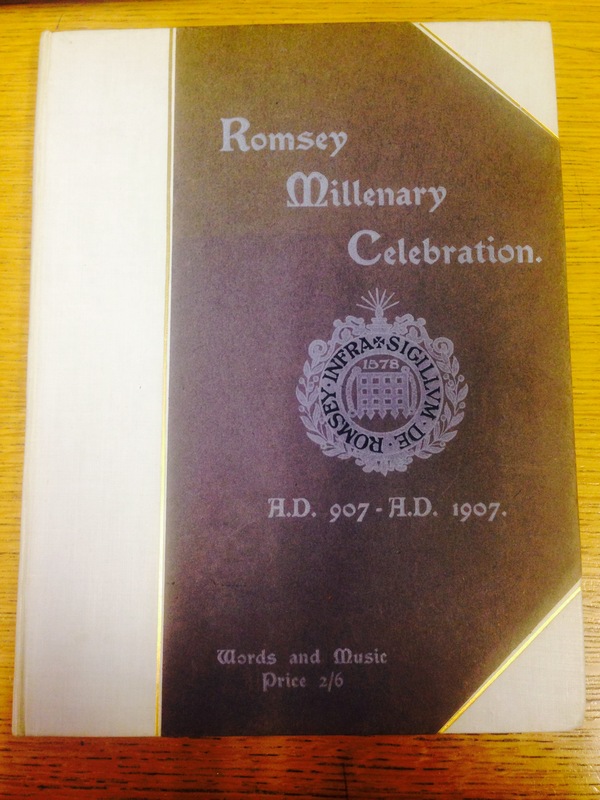 The celebrations also focused on the 300th anniversary of the Incorporation of the Borough of Romsey by King James I in 1607. 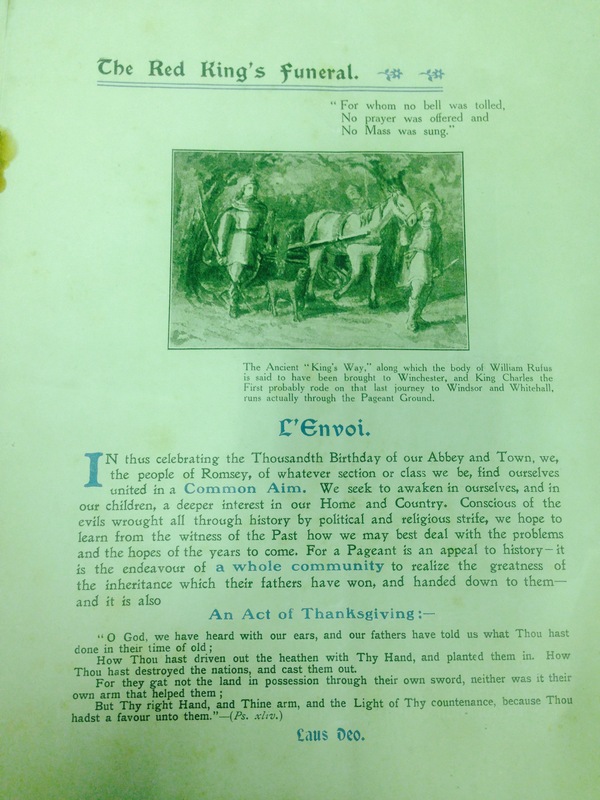 Our object of the week this week is a programme of events from the 1907 pageant. 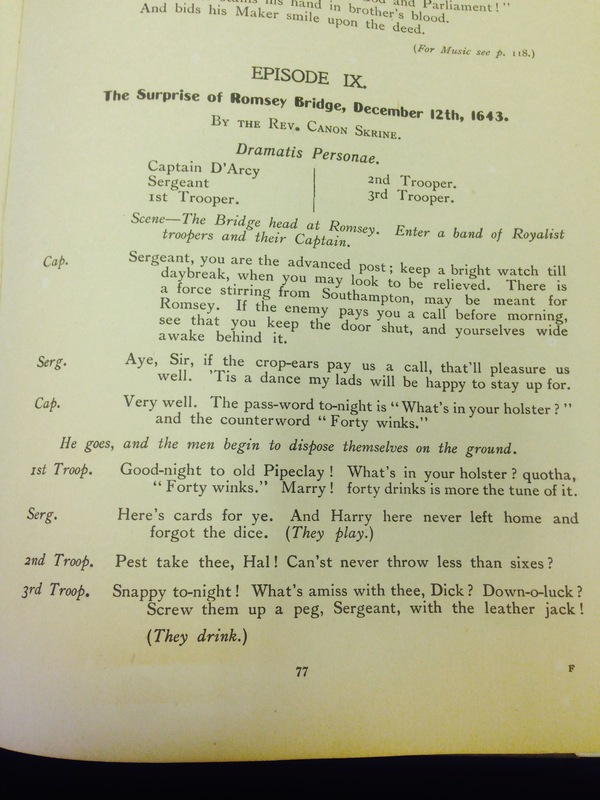 We have a couple of programmes in our collection with varied levels of detail. This programme resembles more of a brochure and includes parking information and maps, song sheets, order of service, scripts and pictures. 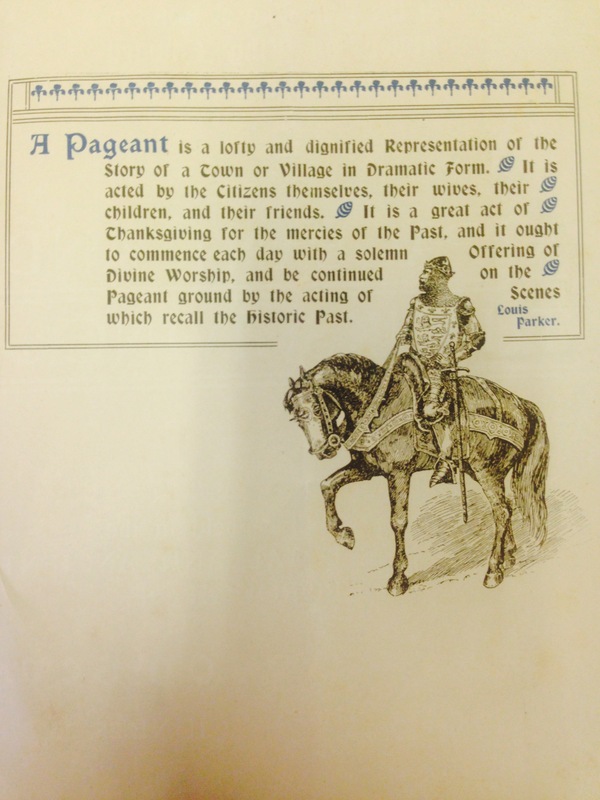 The pageant in Romsey was held in Broadlands Park on the 26th, 27th and 28th June 1907 and combined worship and theatrical performances, and it was the local population who took part in the acting. There was ample parking and refreshments available all day. Information in the programme includes directions for those arriving by train, which suggests that the event was popular and drew in guests from far and wide. Much like the modern-day carnival, the pageant was a time for the local community to come together and celebrate their common past and love for their home. The programmes emphasised the importance of everyone coming together from ‘whatever section of class [they] be, find[ing] [themselves] united in a common aim’ and we can see that ticket prices ranged between 2 Shillings and £2, 2 Shillings. The full programme was an impressive piece of work, and would have cost £2, 2s itself to purchase. The dramatic representations covered the entire 1000 year period between 907 and 1907 and covered all sorts of events such as the founding of the Abbey, the dissolution of the nunnery, to a fight between Roundheads and Cavaliers at Middle Bridge. 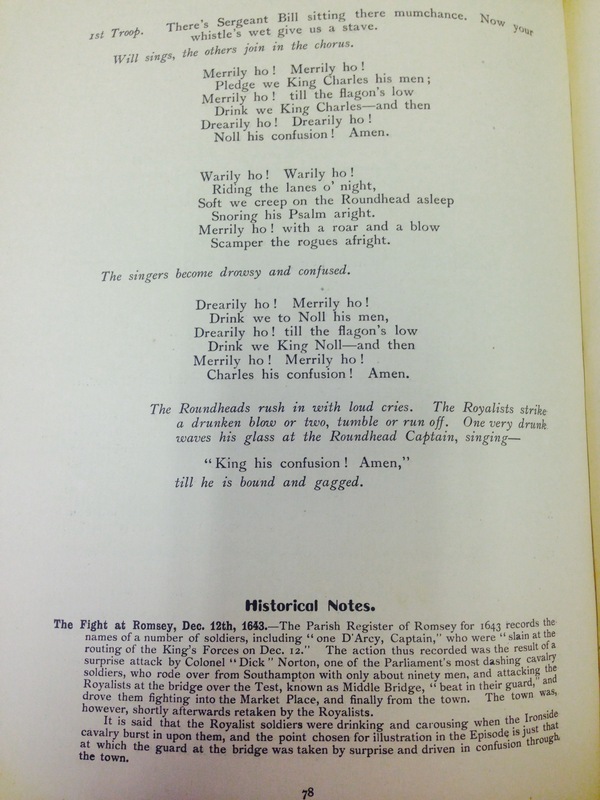 Songs and hymns were carefully chosen to represent the period within which the plays were set. Pageants have been a part of English culture since the middle ages and in 1907 the people of Romsey came together to celebrate two historic moments of the town’s past. From 1905 onwards people throughout Britain were celebrating their local and national history by re-enacting important events. We can see from the programmes available to us that the crossover of country-wide and local narratives were as important in this pageant as they were across the rest of the country. Pageantry became less popular as the century progressed, but there are still modern examples – E.g. the opening ceremony of the 2012 Olympics titled The Isle of Wonder incorporated elements of pageantry on a grand-scale to include the celebration of the Industrial Revolution and the NHS amongst other things.